Khang Zhipa has a heart of gold at his young age of thirteen. He is a devoted doctor’s apprentice and taking hours upon hours a day collecting herbs for medicines. After long days in the fields, his work usually does not end. There is the drying of herbs and boiling and stirring of herbs to make medicinal salves and teas. He is not complaining, because he loves his work and helping people. One evening after another long day, an entire group of a wedding party seeks shelter in his town and home. Among them, is a young bride, close to Khang Zhipa’s age. As the two of them become acquainted, the bride’s entourage has left the town and left the bride to stay! At this point, he finds out, that he is her betrothed…or at least that is what it seems to be. It sort of ends on a cliff hanger. But Khang Zhipa stays devoted to his cause and does not become too flustered about what the others are saying about his gorgeous bride that was so eager to get to know him. He rather enjoys her company and help with the herbs at the moment. The cover of this graphic novel is gorgeous. I wish it was more colorful on the inside pages. The premise of a love story set in a Tibet village is what drew me to this novel. It sounded wonderfully foreign. It is one of the places on my bucket list to visit. Since volume one of this series served as an establishment of characters, there wasn’t much culture other then the family and medicinal aspects explored. But it was enjoyable to read and I would give volume two a try. 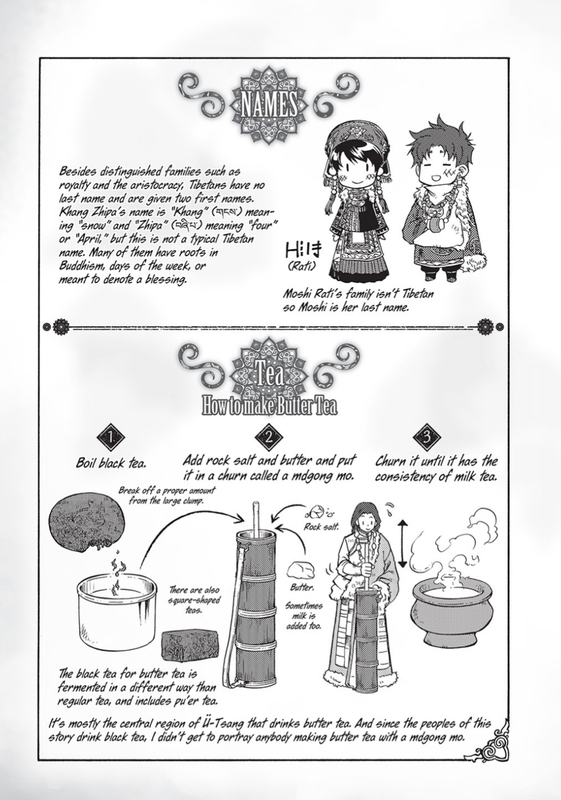 I also looked up some of the Tibetan foods and liked the pages at the end with extra graphics. I received a copy of this title from Netgalley in exchange of an honest review. All opinions are my own. Thank you.